I am lazy by nature, very lazy. If I were to choose something to describe my laziness, it’s probably snake. Yeah, I am kind of like a snake. I don’t like to move around too much, unless I really have to, for example: when I have to eat or when nature calls. My perfect way of spending time is just to sit around and do nothing. In my opinion, being idle is one of life’s greatest luxuries. Sitting around, lying about, curling up in a ball on the couch, in the bed, just do nothing. Well, throw in some day dreaming here and there…you get the idea. But I feel lazier than usual recently. I must have been bitten by a giant lazy bug–I am lethargic, unmotivated, sluggish, and blah. I still cook, but I cheat a lot, such as this claypot chicken rice without claypot. I love claypot chicken rice but I am too lazy to cook it from scratch. So, for convenience purposes, I used rice cooker. Why not? Who has time to stand there in front of the stove and wait for eternity for the chicken rice to cook in the claypot while there is a do-it-all-by-itself rice cooker? Duh. I have better things to do outside of the kitchen. I am going to enjoy this summer and take things slow. So be prepared to get one or two posts a week from me. Be rest assured, even though I am lazy, I never sacrifice taste or authenticity when it comes to my cooking. Claypot Chicken Rice (without Claypot) recipe - I love claypot chicken rice but I am too lazy to cook it from scratch. So, for convenience purposes, I used rice cooker. Chop the chicken breast and chicken drumsticks into pieces. Add the chicken seasoning and mix well. Marinate for an hour in the fridge. Rinse and clean the rice in a rice cooker as if you are making steamed rice after the chicken is marinated for an hour. Add the rice seasoning and cooking oil into the rice and start cooking the rice. At the same time, heat up a wok with some cooking oil. Add in the chicken and shitake mushrooms. Quickly stir-fry the chicken until half-cooked. Add in the chopped scallions. Dish out and set aside. Deep fry the salted fish and set aside. Add the chicken into the rice cooker when the rice is almost dry (about 7-8 minutes) and continue to cook till rice is completely cooked. Leave the rice cooker on "Stay Warm" for 15 - 20 mintues before serving. Top the chicken rice with fried salted fish and serve immediately. That looks pretty tasty. Do you have a recipe? gal u need some real inspiration, like maybe go cocking without oooking? Or got anything to do with boys or not ? Or maybe its Men again. By looking at the title, I was wondering – Oi, where got claypot??? There goes the first sentence….’I am lazy’..lol! Looks tasty though..
At the frequency you post, I would NEVER call you lazy! I just wanted to thank you for your kind comments on my site regarding my move away from SF. You are a source of inspiration and friendship, and I am glad that I “virtually” am getting to know you from your food blog. Best wishes Bee! The oven also works for clay pot rice, but it’s too hot this month to use the oven. Crock pots do an ok job. Sounds like that lazy bug is going around! I’ve been bitten too. *Psst* Let you in on a little secret, am a “snake” by birth..I call it being efficient…not lazy ;) ROFL. I love claypot chicken rice… the best I had was in S’pore… it was so good! i really really like the picture of the bowl of rice. Its not just the rice, but the whole picture. With me, laziness is an actual character trait rather than being a bug bite. So consider yourself lucky that you can become productive whenever you want;) Me, I’m lazy by nature. Can’t wait for the recipe. my mum had once made claypot chicken rice using the rice cooker! nice! and i tot i was the only one getting the lazy bug fr the sun! lol! Go lie down or laze around, the recipe can wait. I am glad that you have the time to just chill. 1. Congrats on your chives pic winning! Hiya…lazy bug in me too…which Spiderman come visit you har, 1,2 or 3? Enjoy the longer days…I’m also posting lesser now. Bee, I’ve come out with this year’s Merdeka Open House topic, pls check Merdeka Open House 2007. Hope you can join the fun. hey gal, that so-called “laziness” may be no more than a case of mild depression. Which hits us all once in a while. You know the feeling — no motivation, daily grind of chores, school, work, cleaning up, the sameness every single day, nothing to look forward to. Like, why clean when it will get messy again in a day or two, right? Antidote? Sleep more. Get involved, whether it be community work, new hobby, seek new friend to go with to art gallery, cinema, etc. Don’t get me wrong, depression hits us all like the flu bug, only that we don’t recognize it. Once you recognize it for what it is, it is easier to get your motivation (and energy) back. Sleep and get well soon. Coz you are everybody’s sunshine here. try http://www.wedeliver.com.my for all your local dishes. They are local leading food delivery service in Klang valley. TRY http://WWW.WEDELIVER.COM.MY – If you like to have your local dishes served at your door step. Is that salted fish I see on your photo? Enjoy your summer as long as it lasts. We are still waiting for summer to arrive in Nantes. We do claypot chicken in the rice cooker to, sometimes. The only problem is that with the nonstick pot, you don’t get all those nice crispy burned rice bits at the bottom of the pot. I don’t need summer heat to be lazy… any season, spring, autum, winter and I’m a slug! i think we will not see RM replying to the comments here because she has a good reason – she is lazy. LOL! Aaaaaaaah! Able to just do NOTHING!! What a luxury!!! Can’t do that anymore with a 2.5 year old running around!!! LOL!!! Cleaning??? Aiya! Get a maid lor! That was one of my “conditions” when I got married! Told my hubby I can cook but definately no cleaning of any kind!!! Ha! Ha! Ha! Can’t wait to check-out your recipe! Babe – welcome to the land of snakes…like ular…very lazy. LOL. Luke – I will share my recipe tomorrow…ok? Pablo – of course, nothing can beat the real claypot chicken rice…this cheated version is just as good as it gets. CP – quick quick, I need the number of your cleaning lady…already sent you an email! Wok and Spoon – good to know that I am not the only one! Unka – wait one more day again for the recipe okay? Joey – thanks for your patience for my recipe…tomorrow okay? WMW – LOL…we shall see. Marvin – I am also lazy by nature…but have no choice but to cook as I don’t live in Malaysia! If I were, I wouldn’t be cooking that much, there is no need to cook because there are tooooo much good food outside. Lucia – yeah, what can I do…have to be lazy sometimes…cannot be rajin all the time right? Mandy – correct, plus there are a lot of “temptations” outside of the house in summer. LOL. Princess – another lazy person…good, welcome to the lazy club / club ular. LOL. Cynthia – thanks for your understanding…yeah, the recipe can wait…laziness just can’t, hehehehe. Amy – Vacuuming is the worst chore in the whole world, and that noise…that noise…gah! Cooking Ninja – yes, salted fish is the best to go with claypot chicken rice….ooooh. Steamy – let’s go, what are we waiting for? Nate 2.0 – exactly…the disadvantage of having a non-stick bottom, in this case….LOL. Stephanie – right on…why choose the season…just be lazy and be proud of it. Whahahaha. Lucia – you really crack me up…too funny…I am replying my comment tonight just so I can surprise you, but recipe can wait one more day. LOL. Tricia – I have asked Chubby Panda to give me the cleaning lady phone number like NOW, AS SOON AS POSSIBLE! Yeh, my house is a mess too. Have been traveling a lot, a lot of junk mail. Floor bearing foot print marks…it must be the weather alright. What is that on the square plate?! Looks like chunks of crispy fried pork belly? Ha! ha! ha! That’s why my rice cooker is so handy. Have Rice Cooker Will Travel, mate! oh that looks heavenly!! 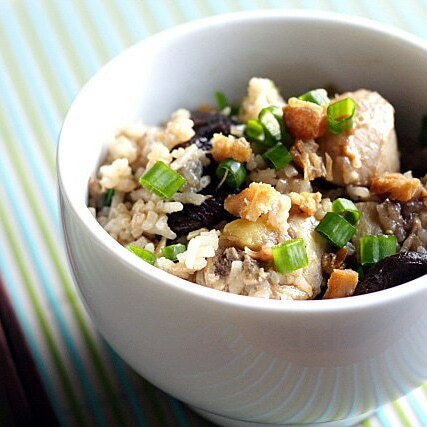 yum, this recipe is getting bookmarked how can i resist this chicken rice?!! This recipe really, really makes my mouth water. I haven’t had claypot chicken rice in awhile. I have a question, in the ingredients section you list ginger, but I don’t see it used in the directions for this dish? I am thinking you would stir fry this w/ the chicken? Thought you would like to know that I tried this recipe yesterday and we loved it!!!!!! Thanks for sharing,.. and I will definitely try the other dishes as well!!! Hey great recipe. It was easy to follow and the results were impressive! I tried your claypot chicken rice recipe last month. I know il be making claypot chicken rice many many more times! That is really sweet of you. Thank you. I have a question. to cook the rice, u add the seasonings to the rice and then do you add water since its being cooked in the rice cooker? ur website is so lovely.. i do miss being a malaysian now. Well, rinse the rice like you are cooking regular steamed rice (meaning with water), then add the seasonings into the water and rice. The water will turn dark in color…does it make sense? thanks for sharing your wonderful recipes! what is chicken boullion powder? You should be able to find the boullion powder in any grocery stores. Err..I live in Spain…not too sure if I can find it here! Is there any substitute for it? Thank you so much! My first experience in cooking clay pot chicken rice and it turn out so well. I knew I’d find something nourishing and soothing and perfect for this cold weather on your site and here it is! This recipe is awesome!! My picky-eating daughter loves it! It’s definitely making appearance on our dinner table again. 5 stars for ease of preparation! Another 5 stars for yum factor! Thanks!!! what kind of fish do you use??? Hi, what’s the ginger for? do we use it when marinating the chickn? Thanks for such a great recipe, I’ve been making this dish using your recipe for quite a few years now and I’ll be cooking it again tonight for me and my wife. The only problem is that when I go on my annual visit to Singapore and try this dish it always seems tasteless in comparison to what I’ve become used to! Hello Bee, I tried your recipe it was delicious. I have a recipe which i use to make clay pot chicken rice. I blend onions, garlic,lemongrass & ginger into paste.The chicken is then marinated with dark thick soya sauce with some white pepper. Half cook the rice and set aside. Heat pan in low heat and pour the paste into it, stir till you smell the fragrance and add the chicken.Add 1/2 cup of water and let chicken to cook, once the chicken is cook add the rice and let it cook, add water if necessary and accordingly. Add salt to taste. Chop some spring onions for garnishing. I have tried the Claymore rice recipe and it is simple and nice. There is only one thing i hope to improve. How can i make the rice less soggy(grain by grain)? Use less water. Every rice crop is different so if it’s too wet for your taste, cut down the water. Hmmm… very nice recepie! I have tried it in my Redmond 4502 – it’s the most delisiouse meal I have ever tried! When I came from home for me there was warm and tasty dinner. The same it in cook book of Redmond, but I never tried it! Thank u! Thank you so much for the recipe! Done it numerous times. I also wrote it up for my blog.